Now that you have a perfectly formatted Word document you will want to ensure that it remains so when you upload it on the various eBook suppliers websites. The easiest way to do this is to create an .epub file and there is a free downloadable tool which you can use. 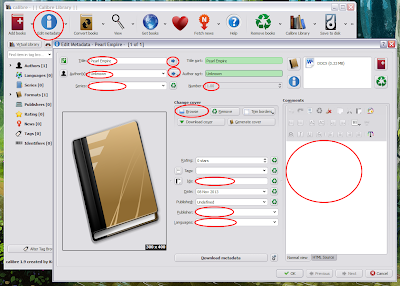 Simply head over to Calibre and download their eBook management system. Once installed launch Calibre’s ebook management. 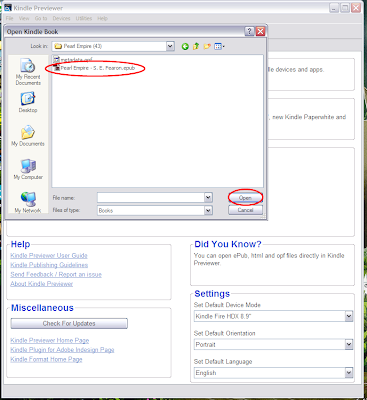 To begin you want to open your Word document by clicking the add books icon located on the main navigation bar. 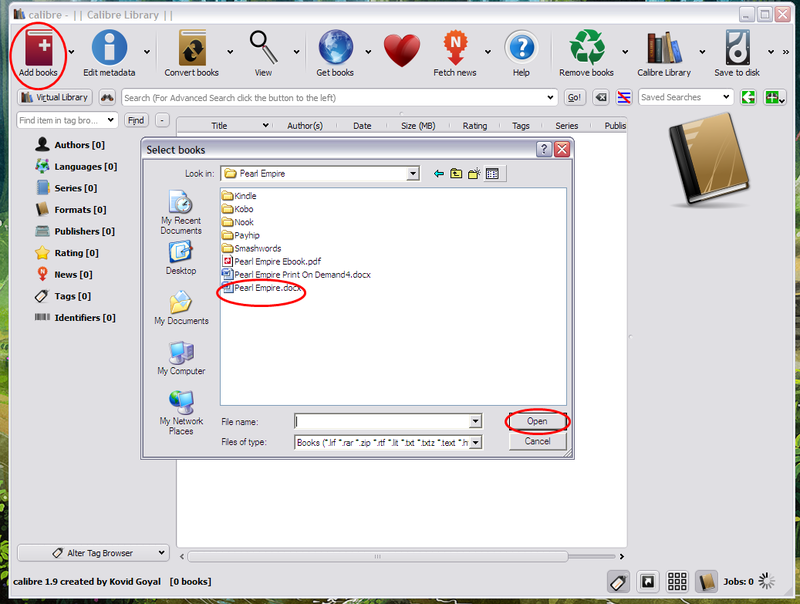 Select your Word document and then when loaded make sure it is selected and then click the edit metadata icon. 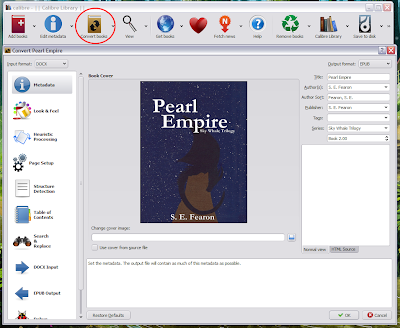 A popup menu will open and here you want to enter all the relevant information relating to your book. 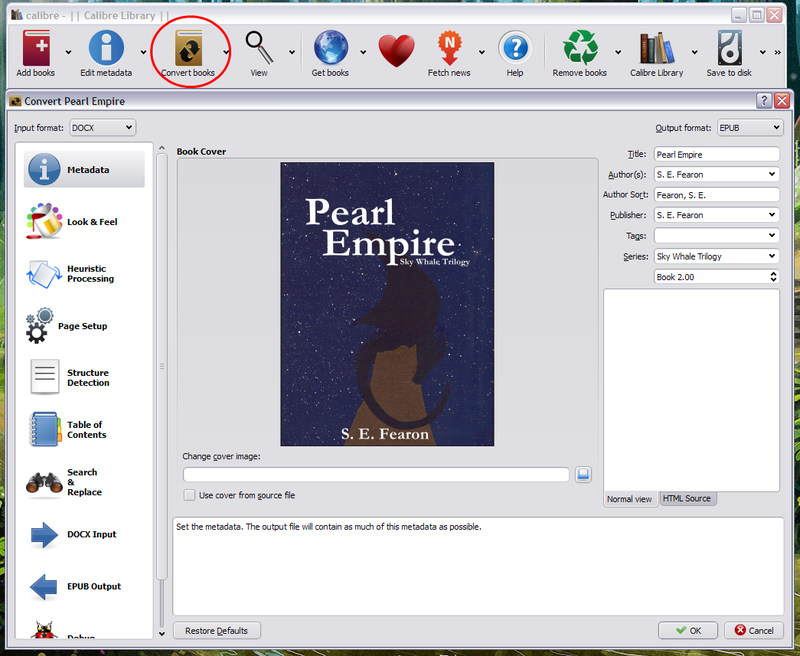 First fill in the title and author(s) section then click the corresponding arrows this will make sure the information appears in the title sort and author sort sections. If your book is part of a series enter the name and in the number section make sure the right volume number is selected. 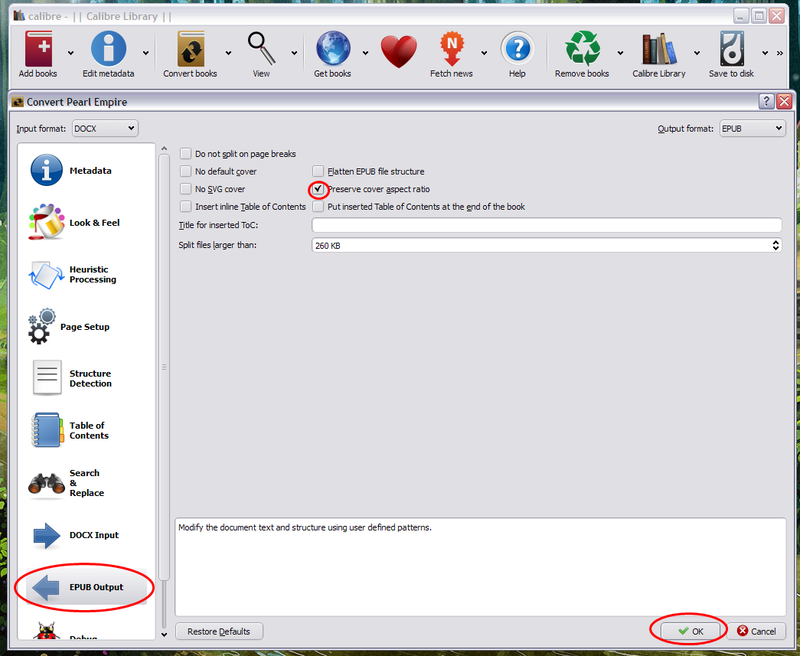 Now go down to the next set of sections, here under tags you can enter keywords which relate to your book. Under Ids you should enter your books ISBN number if you have one. You don’t need to worry about the date or published section but make sure to note the publisher and select the correct languages. Then head over to the comments box and here if you wish you can enter your books synopsis. Next you will want to upload your cover, so under change cover click browse and then select your desired cover image, then click okay. 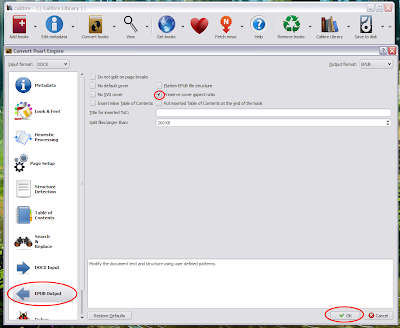 Now its conversion time so click the convert books icon. 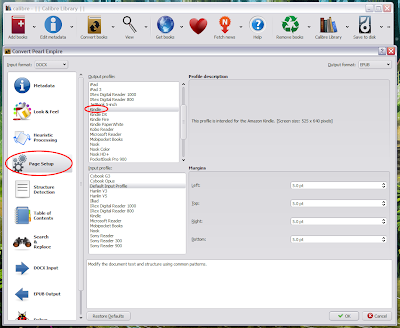 In this popup menu you will see all the details you assigned in the metadata section. 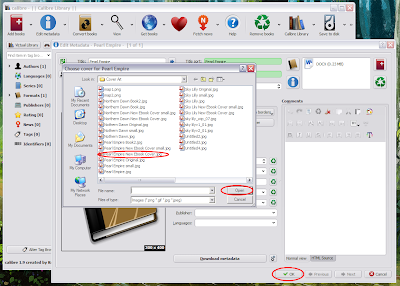 There are only two things you need to do before converting your file. 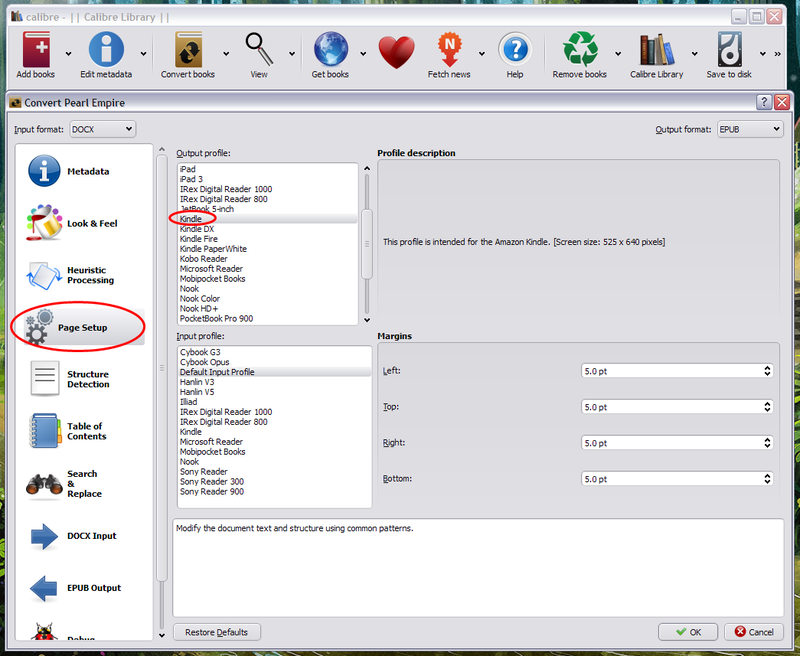 First click on page setup and then under output profile you will want to scroll down and select a preferred format. 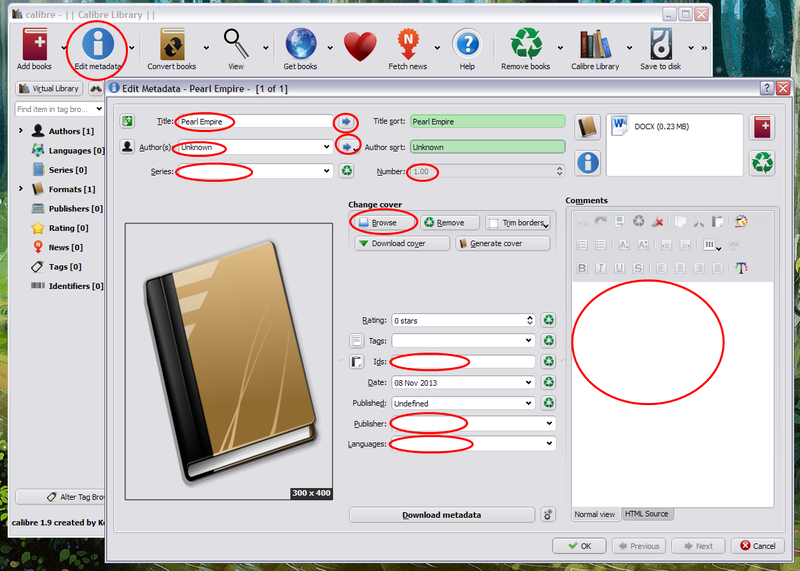 It is best, if you plan to publish on some of the major eBook suppliers, to make an .epub for each eBook reader. 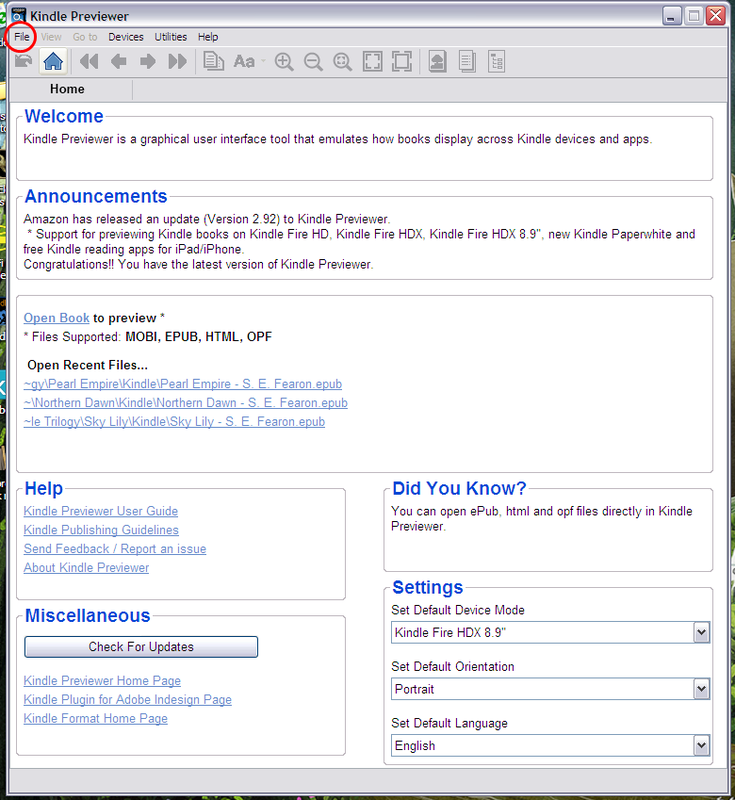 For example if you plan to publish on Amazon make sure you select Kindle of if you plan on publishing through Kobo select Kobo Reader. 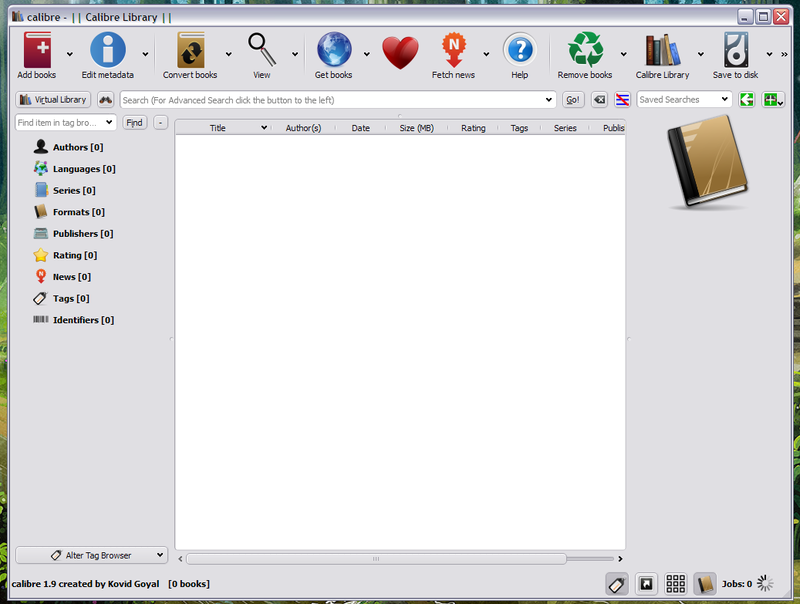 It is also advisable that you create an .epub which can be used on multiple readers by selecting Generic E-ink. 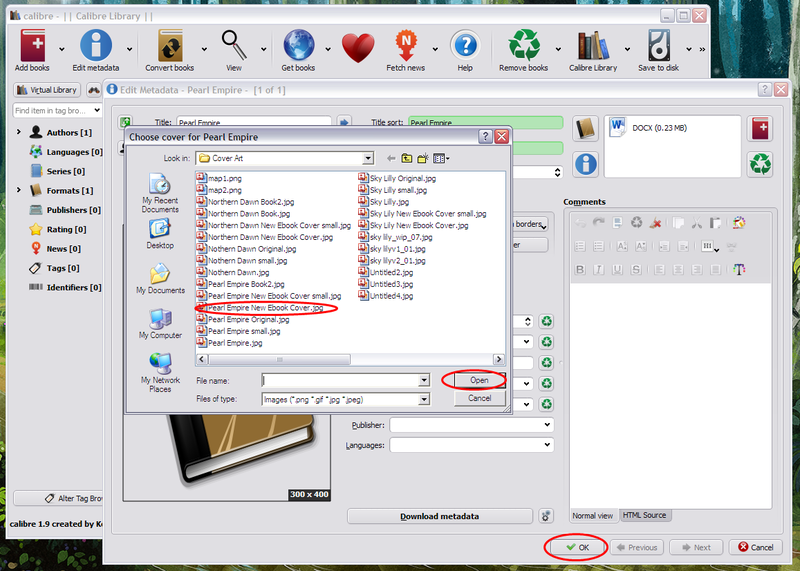 Next you want to click on epub output and select preserve cover aspect ratio, now you can convert your file; once you are done you will find your new .epub in a new folder within your Calibre Library folder. 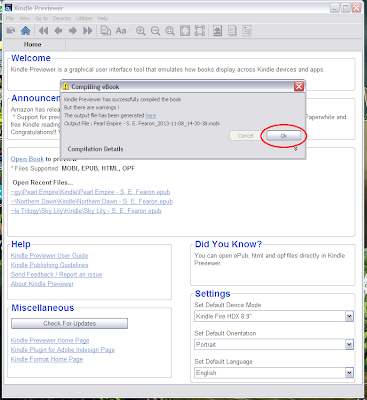 There is however one more step to the process if you want to publish on Amazon, you need to convert your .epub to a .mobi. 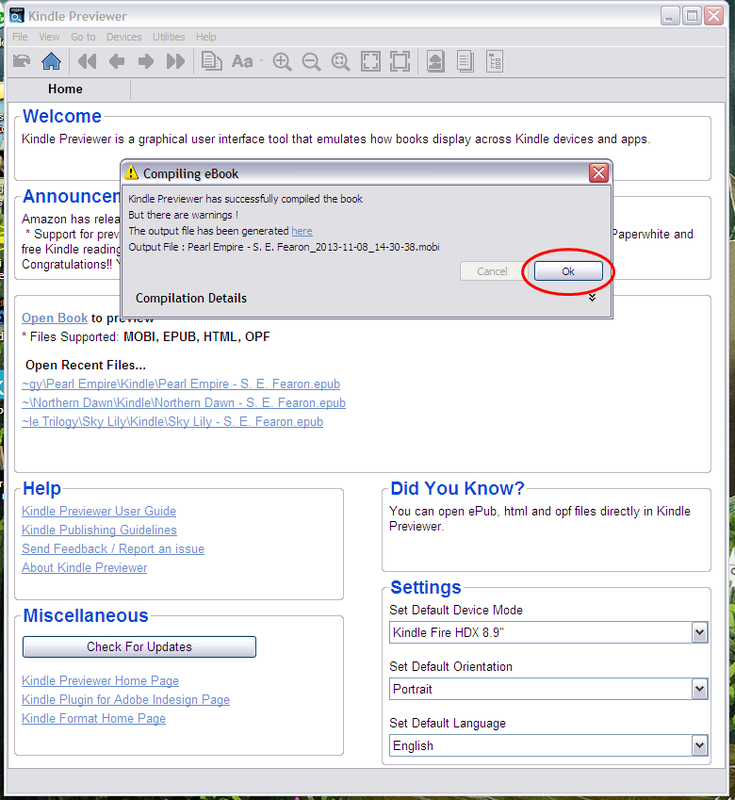 It is advisable to do this through Kindle Previewer rather than creating a .mobi through Calibre as Amazon will not accept it. So head over to Amazon and download the Kindle Previewer. 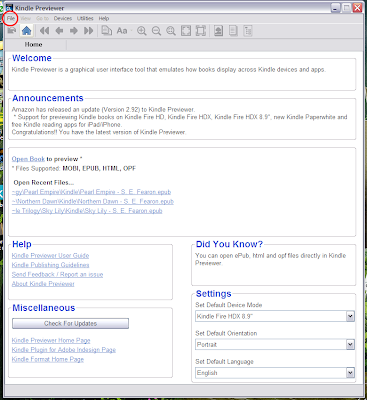 Upon launch you want to click on file located on the main navigation bar and in the drop menu click on open book and then select your .epub file. 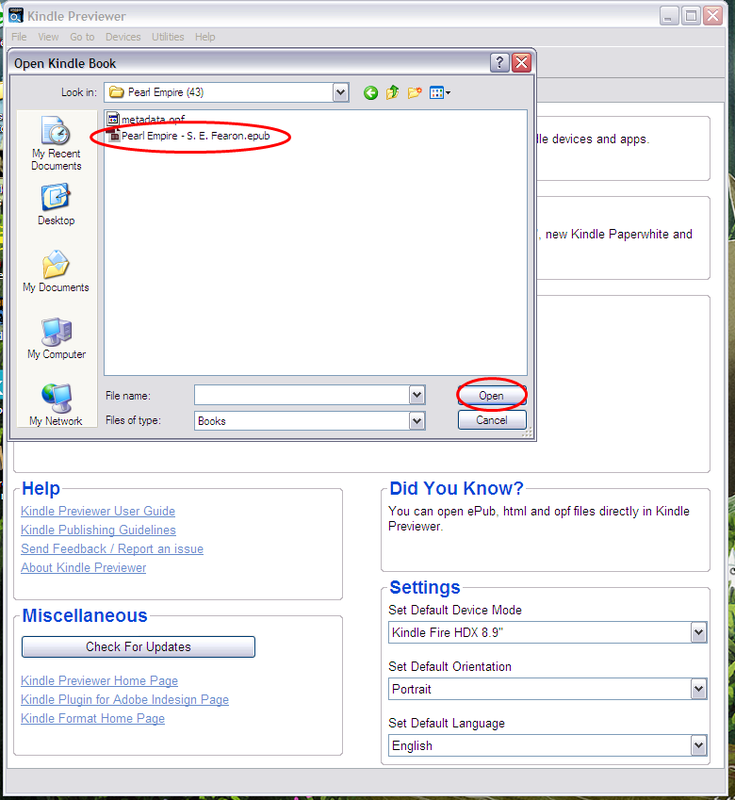 When you open the file the previewer will automatically create a .mobi file. Then all that is left to do is locate the new folder, which will be located in the same folder that you uploaded the .epub file from, and within that new folder you will find you Kindle compatible .mobi which you can then use when publishing your book through Amazon. If you require more help regarding Calibre you can find it here.